Why did we read this book: Thea is a sucker for apocalyptic stories of any nature, and Ana was willing to give this a try since it was on NetGalley and had a lovely cover and cool synopsis. Now and then I try to read things outside my comfort zone. I am not a huge fan of disaster/apocalyptic stories but once in a while I will give them a go. I decided to read Ashfall because it is a story dealing with the eruption of the super volcano under the Yellowstone National Park. If you didn’t know, the eruption of a supervolcano such as this would have terrible consequences for life on earth. The amount of ash that would be released into the atmosphere would compromise crops, block the sun, cause health issues on humans and animals and basically have a long-lasting effect that could potentially mean the end of human life on earth. The Yellowstone Supervolcano is geologically expected to erupt pretty soon and it might even happen within my lifetime. Out of all possible apocalyptic scenarios (a meteor hitting the earth, solar flare), this is the one that totally, totally freaks me out. So, Ashfall follows teenager Alex, left alone for the weekend when his parents and baby sister go away to visit his uncle. The story starts in the direct aftermath of the supervolcano’s eruption. Alex is miles and miles away from it but feels the repercussions almost immediately: his house is destroyed, all means of communication fail, the ash starts to fall continuously and the day becomes night. He is taken in by his next-door neighbours and they spent the first few hours huddled in darkness and in panic trying to figure out what is happening. After a violent encounter with a looter, Alex decides to make his way across the state to try and find his family and that’s when things get really heavy. The first few pages of Ashfall are some of the most gripping – and terrifying – ones I have ever read. I can only but imagine the horror of seeing ash fall continuously to the point where this no light and then the overwhelming NOISE and not knowing what is happening because of course there is no electricity and no mobile or radio signals. I mean, can you imagine? The problem for me though, was how the story progressed after the first pages. And I am aware of how silly and counter-intuitive this is going to sound but Ashfall is exactly everything one expects from a disaster novel. The immediate natural events post-eruption events are so precise, so thoroughly enacted it is almost like the author was following a pre-set script about what could happen in a nightmarish scenario such as this one. Which I guess, he probably was – I mean, there is only a certain amount of liberty one can take when it comes to a super volcanic explosion, right? But the events also seem to follow a certain script when it came to how humans reacted: panic followed by chaos followed by the general degeneration of the human race into animals. Except for the hero, of course: because the hero saves the day at Great Cost, and the hero becomes a Man and even falls in love with a Great Girl. But the thing is, I found it really hard to believe that things would go so badly so soon. It had only been a few DAYS after the eruption when people started to turn on each other, some turned into savage cannibals and even government camps for refugees were already becoming concentration camps. I mean, years in the future, yes, I can swallow it. Only days after it? No. It is almost as though the author fast-forwarded to the post-apocalypse when the apocalypse was only but starting. There is very little of the panic and the absolute chaos I would expect to start with and a lot more of the mindless violence and the opportunism that I associate with the later stage of the End of the Days. Of course, since no one has survived a supervolcano explosion lately so who is to say that the author’s vision is wrong? Having said that, the biggest problem for me was how emotionally underwhelmed I was by the entire thing after those first few pages. This to me is a big deal because the book addresses ponderous things, the end of civilization, death and mayhem and yet…it left me cold. I was saddened by certain events but not devastated; I was afraid but not terrified>; I was sickened but not disgusted. I believe part of this stems from the book and how it was written. I felt certain emotions, especially those concerning the main character, were told rather than shown. But perhaps the greatest part of my detachment comes from not enjoying that sort of story, which brings me back to my main point. This book is way outside my comfort zone and not a book for me at all. Your mileage may vary. I think Ana makes some very insightful and valid points concerning this book in particular, and also raises some interesting discussion about the apocalyptic/disaster novel at large. I will say this first: I am a huge fan of the disaster novel (and film). I love movies like 2012 or Independence Day or The Day After Tomorrow1 and tv shows like The Walking Dead and books like Lucifer’s Hammer and Flood. Call it a morbid fascination, but there is something about apocalypses and global disasters that gets my motor running. So, that bias on the table, I am predisposed to like books like Ashfall. I also am prone to believe that many people in these extreme situations will be incredibly desperate, and unlike Ana I do believe that many will resort to violence, looting, cannibalism, and worse, and I believe that change will occur very quickly. This is a philosophical question with two opposed schools of thought: choosing to believe in the inherent goodness of man, or choosing to believe that man’s desire to survive will overpower any other ethical consideration. I’m inclined to believe the latter (especially in light of recent real-world catastrophic disasters and their fallout), although clearly opinion varies. Because I do believe that an ash-covered world which would almost immediately kill crops and poison living creatures, I feel that the descent into violence that is seen with Ashfall, even being so close in time to the eruption of the supervolcano, rings true. It’s clear that Mr. Mullin has done his research and he carefully extrapolates a vision of the world devastated by volcanic ash that is terrifying and seems (at least to me, as a complete layman and mere apocalypse fiction enthusiast) scientifically plausible, provided that people would survive the blast at all. These are the parts of this book that worked for me; that is, the imagining of how life would be in a smaller Iowa town following the eruption of a massive volcanic force to the west. The ordeals that Alex overcomes, the physical problems of moving through thick layers of poweder-fine ash, the very real threat of starvation, dehydration and hypothermia, are painstakingly detailed and make this grim portrait of a gray-dusted wasteland of a future seem all the more harrowing and real. While the catastrophe itself and aftermath are well-written, however, I did have some issues with the book. My qualms with Ashfall lay not with the plausibility of the story, but rather with the main character and the originality of the novel. From a characterization perspective, Alex is a little bit…hollow. He feels and emotes, but his narration is often tell-y and his vocabulary seems more to me like that of an adult writing an apocalypse novel than that of a teenage boy living the nightmare. In contrast, though, I should mention that I loved teenage female protagonist, Darla, who is brash, strong, and speaks her mind. Alex felt more like a fully fleshed out character when he is interacting with Darla, and the novel definitely picks up when she’s introduced to readers. The other aspect of Ashfall that didn’t quite cut it (for me) is the level of familiarity with regards to the actual plot. Put simply, Ashfall is late to the parties thrown by Cormac McCarthy and Susan Beth Pfeffer. Ashfall‘s vision of the apocalypse is very similar to the wasteland of The Road and the volcanic ash-caked world of Life As We Knew It and The Dead and the Gone. These titles from McCarthy and Pfeffer are breathtaking, harrowing, terrifying (post-)apocalyptic gems, and they are a tough act to follow – unfortunately, and understandably, Ashfall can’t quite compete, and it’s hard not to compare Mike Mullin’s novel to these other preexisting works. That criticism said, I still was engaged with this novel and certainly have an emotional investment in Alex’s story. 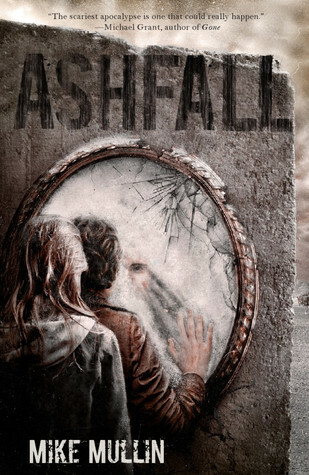 I’ll be back for more, and, if you’re a disaster/apocalypse junkie like me, Ashfall is certainly worth the read. I was home alone on that Friday evening. Those who survived know exactly which Friday I mean. Everyone remembers where they were and what they were doing, in the same way my parents remembered 9/11, but more so. Together we lost the old world, slipping from that cocoon of mechanized comfort into the hellish land we inhabit now. The pre-Friday world of school, cell phones, and refrigerators dissolved into this post-Friday world of ash, darkness, and hunger. But that Friday was pretty normal at first. I argued with Mom again after school. That was normal, too; we fought constantly. The topics were legion: my poor study habits, my video games, my underwear on the bathroom floor—whatever. I remember a lot of those arguments. That Friday they only fueled my rage. Now they’re little jewels of memory I hoard, hard and sharp under my skin. Now I’d sell my right arm to a cannibal to argue with Mom again. You can read an excerpt of the first two chapters online HERE. Okay, I think this book sounded interesting, but I agree with Ana that on some levels (concentration camp formation, ect) the post-disaster period sounds fast-forwarded. My biggest beef is this – how the hell can the narrator do all of this stuff? How are people alive? I once watched a History Channel special on the top 10 or 20 ways to die via an apocalyptic-type scenario, and this was one of them. From what I remember, it would take years – like years and years and years – for the ashfall to be even remotely tolerable for a human to stomach. They said the survivor rate would have to live underground with limited resources for a long time before they could ever possibly be able to go out into the world again. This, however, is speculation. I’m not sure if the program or what I remember from it is accurate. However, I did gather that the basis of this is that the super volcano is huge and the possibility that this character can move around is one that doesn’t strike me as probable at first glance. I could be making a lot of off-base assumptions, though. Disaster and immediate aftermath stories are one of those genres which I have a love/hate relationship with. I love the lead-up, the details of how the people survive, the steps to working out how to live when all the systems have broken down. I hate when they turn into stories about bad people. About the almost-inevitable encounter with the creepy man/lady who was trapping people in their basement way back before the apocalypse. About the rise of the tinpot dictators, and how those stories turn into survivor v tinpot dictator stories. I’ve been torn on my desire to read this one since I first came across it, and I’m afraid your somewhat torn reviews haven’t helped. It’s a situation that hits close to home for me having grown up in Wyoming, very near the park, with the knowledge that we’d die in the blast if it did happen in our lives. Actually, I somewhat morbidly use this as propaganda to try to convince my boyfriend we should move back-better to die in the blast than the aftermath, right? i just read ashfall a couple of weeks ago and i think i have to agree with thea on this one. i think society would collapse very quickly without communication, food, or water. and while terrible things happen, there’s also good things happening. darla and her mom help alex when they don’t have to. alex helps a mother and her family. there’s a woman at the government camp that gives darla and alex a bit of food. so even though people are taking advantage of the situation, there are also people who are willing to help others. while it doesn’t compare to the harrowing bleakness of the road, i don’t think it’s meant to. i think it’s a different kind of story, one that i really enjoyed. thanks for sharing your thoughts on it. I am always surprised when I read such reviews and people speak positively of Pfeffer’s “Life as we knew it”. Quite honestly I find Mullin’s books preferable to her’s for one reason: Mullin’s characters use their brains and their wits, while Pfeffer’s characters are incredibly stupid and morally disgusting. Let me go into detail: Pfeffer’s main character’s planning for procuring food are badly made at best. The girl goes back to the lake during those last summer days, and I honestly expected her to finally remember that bullrushes are edible, and there is waterfowl and plants… but no. She swims and refuses to think. Then her mother forbids her to go. (They had access to the town library as mentioned in the books, but they never THINK on getting a book on edible plants and herbs) Her mother worries about the volcanoes and a potential ashen winter – but she does not even think of using the windows of the abandoned houses to build a greenhouse. Not to mention of a Mother in Pfeffer’s books that encourages her daughter to eat less so one son can have more… that’s so disgusting and no one calls her on it that I wondered what kind of lessons that author wanted to convey. Mullin’s characters act much more competently, using their wits and the means they have. So compared to Pfeffer’s series I find Mullin much better written, thought out and with a lot better characters.